Diamond Select Toys and Art Asylum have revealed their first line of Iron Man 3 Minimates set to arrive in specialty stores and Toys "R" Us this spring. Following the release of a few trailers and promotional images, there's not too many surprises, but fans can still get one of their best looks at each character (in blocky toy form, anyway) so far. Just look at all of the Mandarin's hardware! The 2" figures will arrive in stores in two packs, although not all of the pairings have been specified just yet. War Machine will come with Maya Hansen and Aldrich Killian will be sold alongside Cowboy Tony Stark in two packs headed only to specialty shops. The rest of the line, according to DST, will be available at TRU, including Iron Man with the Mandarin and Iron Patriot with "a top-secret figure." Two additional figure sets exclusive to TRU have yet to be revealed as they're still under embargo, but should be announced in the near future. 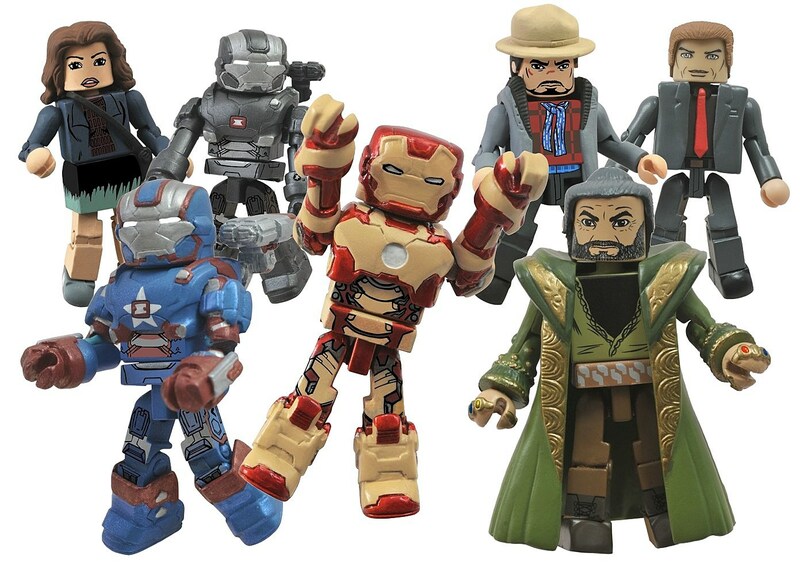 There have been more than half a dozen Tony Stark Minimates and almost as many War Machines, but this line will deliver just the second Mandarin and Iron Patriot figures following each character's respective comic book versions. The new movie versions of Maya Hansen and Aldrich Killian, on the other hand, are the first expressions of each character in the Minimates line. The latest Mark XLII Iron Man armor figure takes the character's total number of Minimates across comic/movie styles to almost 40, which should please or totally confound fans building their own mini armories.